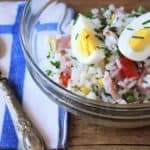 One of my favorite dishes that I enjoyed on my recent trip to Italy is this simple rice salad. Very simple as it hardly requires any cooking at all. It’s basically tossing together a few ingredients that you probably have sitting in your pantry, refrigerator or freezer right now. This is what Italians make during the summer when it’s simply too hot to do any major cooking or when they need to put a meal together in little time. What’s not to like? 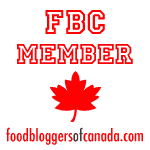 You’ve got your vegetables, your protein and it’s incredibly versatile. There are endless combinations of ingredients you can use. 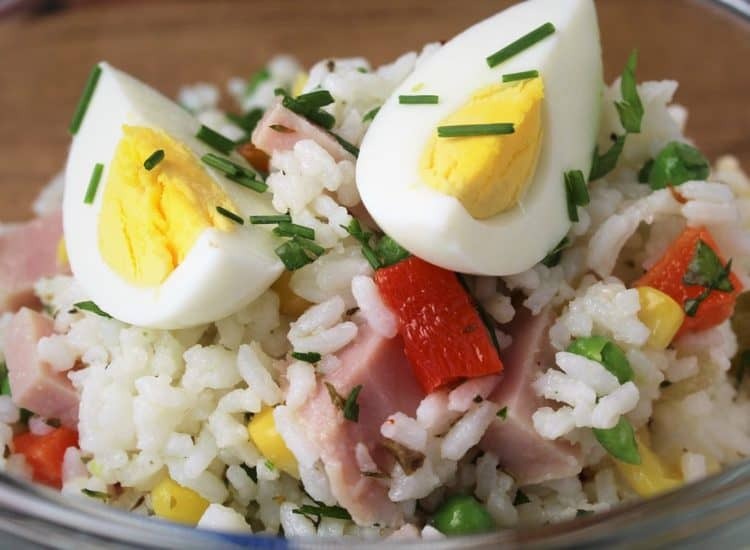 In fact, this is not so much a recipe but a suggestion of what you can include in your rice salad depending on which ingredients you have available. Vegetables: pickled vegetables (giardiniera); sliced black or green olives; corn; peas; sun-dried tomatoes; artichoke hearts; or any other leftover vegetables lurking in your fridge! All the rice salads I sampled in Italy contained “giardiniera” which are pickled vegetables preserved in oil or vinegar and typically served as antipasto. You’ll find these in any Italian grocery store. I love the briny flavor that these pickled vegetables add to the salad. I also add a bit of the olive oil from the jar to the salad for extra flavor. Toss in some freshly chopped herbs and you’ve got dinner! On a hot summer day this salad makes a satisfying meal. It can also be a side dish at your next barbecue or part of a buffet table at any gathering. You can easily multiply the ingredients to feed any size crowd. Buon appetito! 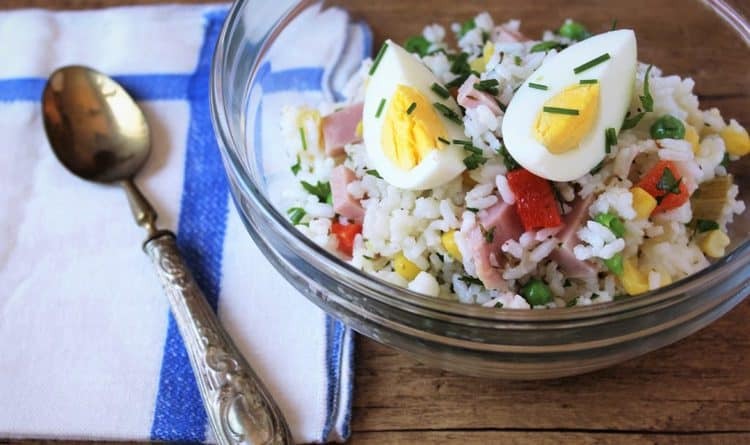 This Italian style rice salad is eaten all over Italy! Ever so simple yet versatile, you can vary your ingredients with whatever you have available in your pantry. Prepare your rice several hours before assembling the rice salad. In a medium sized sauce pan, bring 2 cups of water to a boil. Add salt and the rice and lower to a simmer. Cook with the lid on for 12 minutes. Turn off the heat and let sit with the lid on for about 5 more minutes, until the rice is cooked. Fluff with a fork and transfer to a large bowl or spread on a cookie sheet to allow to cool. Place in refrigerator and allow to cool completely. 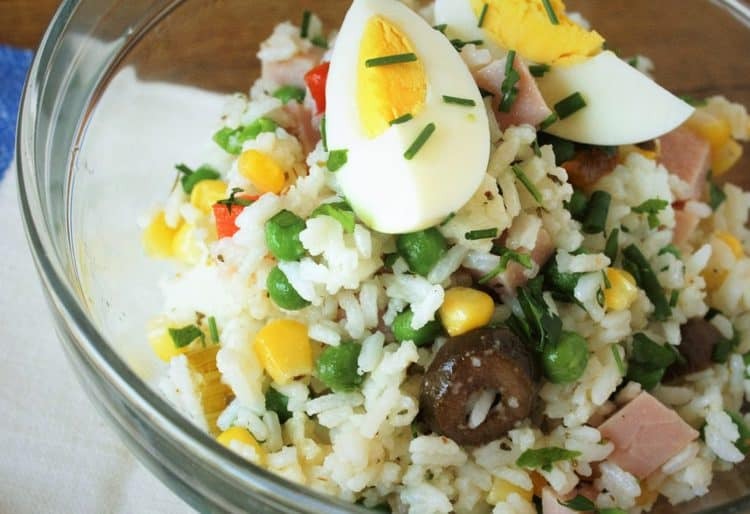 Place cooled rice in a salad bowl. If using frozen peas and corn, blanch the vegetables (separately) in boiling water for 1 minute. Drain and rinse under cold water to cool completely. Add remaining ingredients to the rice and toss well.